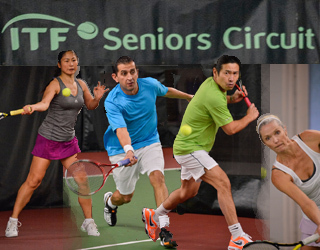 This year's ITF Senior�s event was hosted by Richmond Country Club and Richmond Tennis Club, February 7 � 11. Photo 1 : Steven Yesowick captured the Men's 60 Singles title by beating Warren Lore in the final, 6-1, 6-1. Photo 2: Max Brown, left, topped Julien Heine, 4-6, 6-1, 2-1 Ret (inj), to win the Men's 40 Singles. Max and his doubles partner Manuel Calvo later picked up the Men's 35 Doubles walkover win as Stephen Kimoff and Joachim Nierfeld forced to withdraw in the final of the round robin. Photo 3: Collen Ostlund fell to Leslie Van Santen, 6-4, 6-4, in the Women's 50 Singles. Photo 4: Macken brothers, Tony, left, and Pat beat Robert Exell and Tim Shoveller, 6-4, 6-4 to win the Men's 45 Doubles title. Photo 6: Stephen Kimoff, left, outplayed Robert Exell in the Men's 50 Singles final. Photo 7: Glenn Richards came short in the Men's 45 Singles and lost to Hannes Blum in a close match, 3-6, 6-4, 6-3. Photo 8: Louise Murphy giving away the ITF awards. Men's 65 Singles Bob Bardsley Ken Dahl 6-4, Ret.